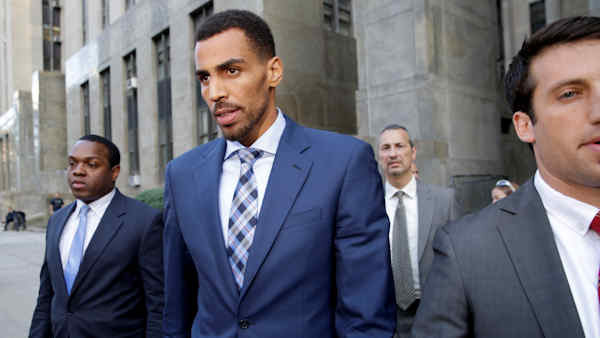 NEW YORK (WABC) -- NBA player Thabo Sefolosha agreed to settle his wrongful arrest lawsuit against New York City and the NYPD stemming from a melee and arrest outside a Chelsea nightclub back in 2015. The incident happened on April 8, 2015, at the 1Oak club. Sefolosha, now with the Atlanta Hawks, suffered a fractured right leg in a struggle with police and was accused of repeatedly disobeying officers' orders telling him to leave the area around the club where another NBA player, Chris Copeland, had been stabbed. The Swiss national's broken leg caused him to miss the playoffs, and he was eventually acquitted of all charges. He claimed officers arrested him without cause. "This settlement is not a concession that Mr. Sefolosha was blameless in this matter and there was no admission of liability by the defendants, but in light of the gravity of his injuries, the potential impact on his career as a professional athlete and the challenge for a jury in sorting out the facts in this incident, the resolution of the case was in the best interests of the city." The Daily News reported Wednesday that Sefolosha will get $4 million.